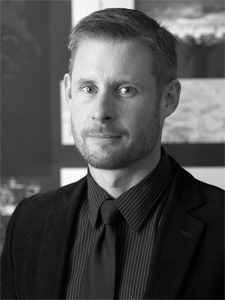 Scott Weir OAA, M.Arch, LEED AP, CAHP is a Principal at ERA Architects Inc, and holds a post-professional Master’s degree in Architecture. Scott has been with the firm since 2000 and specializes in heritage conservation, adaptive reuse, new design, heritage planning, and advocacy for heritage buildings, cities, and the built environment, with a particular interest in the custom design and renovation of residences and cottages. An avid photographer, bibliophile, and writer, Scott’s interest in cultural theory and North American urbanism has led to his work being published in a variety of architectural periodicals, including an award-winning column on architecture, urbanism, and conservation for the National Post. He has been formally trained in Canada, Italy, and the U.K., and he regularly guest lectures for various programs at the University of Toronto, York, Ryerson, and Carleton Universities, as well as being a mentor at the College for Creative Studies in Detroit. Scott also enjoys getting his hands dirty on his own conservation and construction projects, and harbours an obsession with his hometown, Detroit.